There are plenty of tutorials and techniques for melt and pour soap that look like gems. However many of them are unclear on exact techniques. There is no “correct” Technique, but here are some tips that we tried and worked out pretty well. Using a hot plate and heat safe beakers are great tools when working with small batches of melt and pour soap. When making large batches of melt and pour soap, using cooking pots are a great option. Hot plates are very affordable, ranging from fifteen dollars for basic and functional plate. And 200 dollars for a fancy lab grade plate, and plenty in between. I like using them when making gem soap that has multiple colors, Because several beakers can fit on one plate. I can make several colors and translucency at the same time. Kept on medium heat the soap should not burn on the bottom, all you have to do is stir occasionally. With a hot plate there is no need to keep nuking the soap with the risk of bringing it to a boil. Mixing soap at different temperatures are great for creating different swirls and color transitions. Adding warmer soap into cooler soap disperses more and makes a bleeding effect. Pouring cooler soap into warmer soap makes a streaking effect. When you pour soap at a relatively cool temperature is easier to swirl than soap that is hot. When you Pour hot soap, there is a possibility there will be “heat swirls”. That is the result of swirls in the soap instead of a solid even color. That is not necessarily a bad thing, It just depends on what look you are going for. If You want a translucent colorful streaks to go thru your gem soap, there are are several options. Clear melt and pour takes glitters and mica very well, unlike cold process soap. For a heavily colored streak you can add pigmented mica to clear soap for an intense streak. For a pearl effect try adding our Xirona mica to our super clear melt and pour soap base. Adding glitters or mica will add character and depth to your gem soap. For example the soap on the right has our Magic Mauve that has shades of pink greens and silver! Adding multiple colors and shades is a great way to add depth and make the soap look more unique. Mix our Soap Colorants to make custom colors. For example pink and orange make peach. I found this online Source to help with mixing your own colors! The more colors and effects make a more realistic looking gem soap. Crystal pendulums are popular among many people. 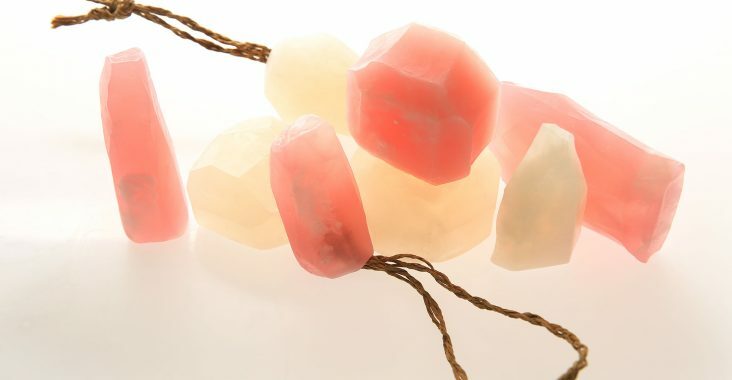 Adding a cotton or water safe rope makes for a unique take on soap on a rope. 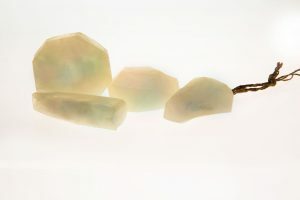 You can even make birth month stone soap pendulums.